Corny Science: Will it sink or float? We are focusing on the harvest theme this week. We are lucky to have family farms close by and we stopped this week at a Farmer’s Market stand and bought some freshly harvested corn. The kids love corn and corn on the cob is always a hit in our family. To celebrate the harvest theme, we decided to do a fun science experiment using the corn. Luckily, this experiment uses very little corn, leaving the rest for eating! Pour a little still water into each child’s cup. Have the children drink the water. Then, have each child taste a little carbonated water. Have them observe the differences between the carbonated and still water. Next, pour some still water into one clear glass and some carbonated water into another glass Have the children observe and discuss the behavior of the bubbles in the carbonated water. Teach them the basic definition of the word buoyancy and use variations of the word throughout the lesson so that they grasp the meaning. The pictures on the left are their reactions to still water and the images on the right capture their reactions to carbonated water. You can see we have never served them soda before. Set the kernels of fresh corn, dried popcorn and popped popcorn on the table. 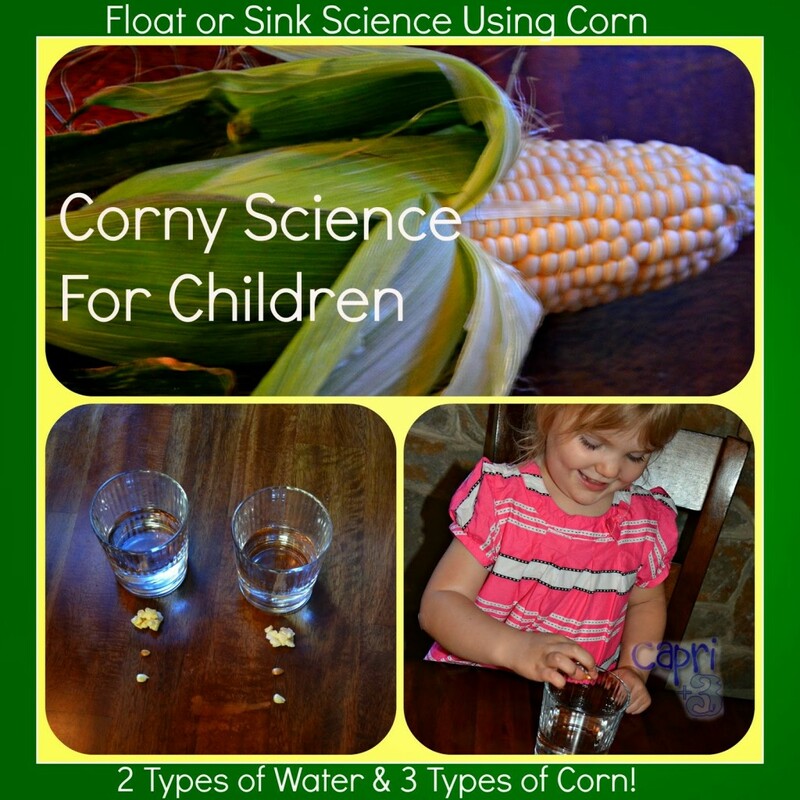 Prior to dropping each kernel of corn into the two types of water, have each child predict if it will float or sink. Then, have your child drop a kernel of fresh corn into the still water and see what happens. Next, have your child, drop a fresh kernel into the carbonated water and observe the result. Repeat with the dried corn and then finally the popped corn. Discuss how the bubbles in the carbonated water help the corn to float. If you’d like to take it a step further, create a simple bar graph that they can color in to demonstrate the differences. The kids had a great time with this experiment and loved seeing whether or not their predictions came true. Some figured out that the bubbles in the carbonated water helped the kernels to float even before we had that discussion. I love to see the look of wonder in their eyes as they make new discoveries. This is AWSOME! I want to try this today because my kids are huge popcorn fans and we just saw the corn in the field. I don't have fresh corn in my fridge – wonder if the frozen corn will substitute in just fine? Hi Amanda. I thought about the frozen corn but have not tried it. I don't see why it wouldn't work, especially if it was thawed. I hope you enjoy giving this a try with your kids. This is a fantastic science experiment for preschoolers! We are going to try it out this week. Thank you Danielle. I hope you enjoy it. What a fun experimeter for them to do.I think this will go over well with my girls, can't wait to try it. I just love how preschoolers find experiments so fascinating! I love to watch them learning like this. My kids will love this! My son found a corn cob at the playground today and was fascinated with it so this will be a great activity to do for us. I love how you tested two different types of water! Sink or float is a favorite here! I enjoy their discoveries too. There is a certain magic in watching their eyes light up. I hope you enjoy the activity. I love that your little one was fascinated by a corn cob. It is wonderful to see the world through a child's eyes. Sink or float is fun. 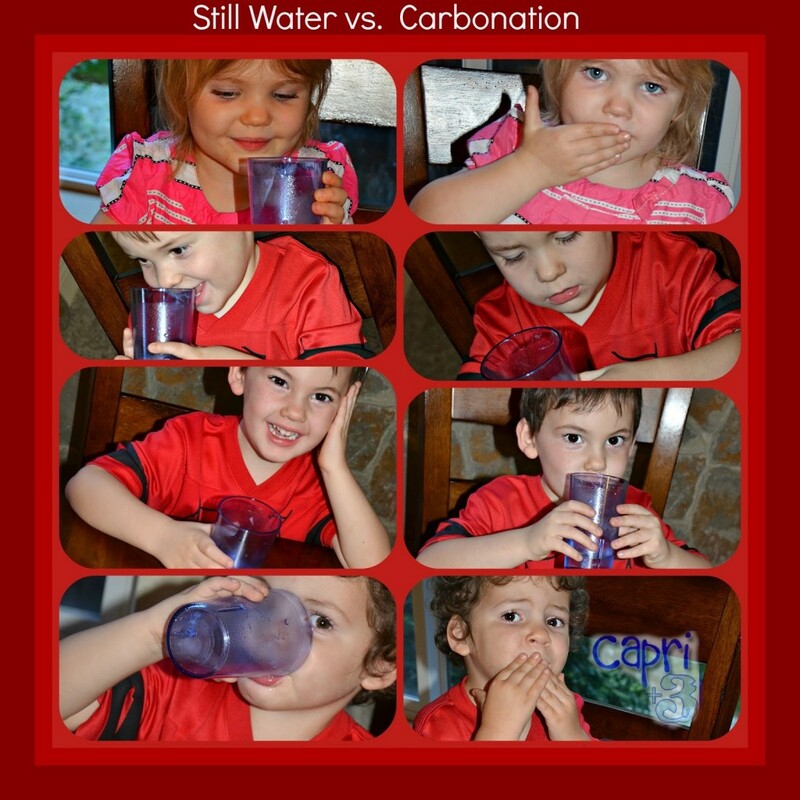 It was interesting to see the differences using the carbonated water. Great idea to vary the materials! What a fun experiment! We did find it more fun to try the different materials in the two kinds of water. Now that we've tried that, using one kind of water would be a little anticlimactic! This is a great science and discovery activity for harvest time! I love how you tried different varieties of corn! Great job! I did not realize that popping corn was so hard to find in the UK. It sounds like you may have found some? Enjoy. How clever! I can't wait to try this. I hope your preschoolers enjoy it. It is a lot of fun. I hope you have as much fun as we did trying it out. I love all the different variables that you tried out! Looks like a lot of fun! Thank you for hosting Tuesday Tutorials. I enjoyed visiting as seeing so many great ideas!